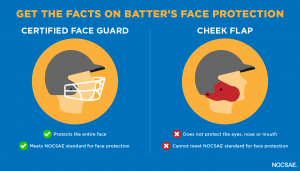 Today, many athletic equipment manufacturers sell cheek flap products for baseball and softball batting helmets that cover a portion of the cheek and jaw. These products are available both as add-on accessories and as built-in features of newer helmets. NOCSAE urges parents, players and coaches to understand the facts. Read more. That is the most important, fundamental fact every athlete and parent needs to know. 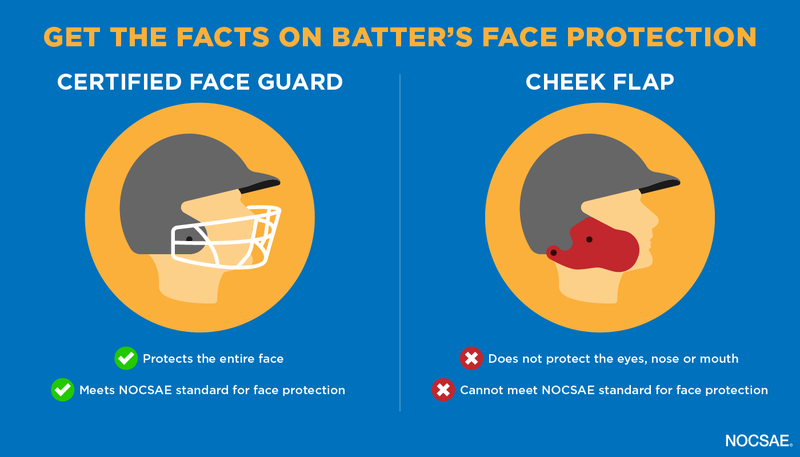 A seal on the back of a football helmet that reads, “Meets NOCSAE Standard” means the helmet passed the most rigorous science-based performance standards in the world. It also means the performance and compliance with the NOCSAE standards has been independently certified by the Safety Equipment Institute (SEI), which is an ANSI/ISO internationally accredited certifying body. 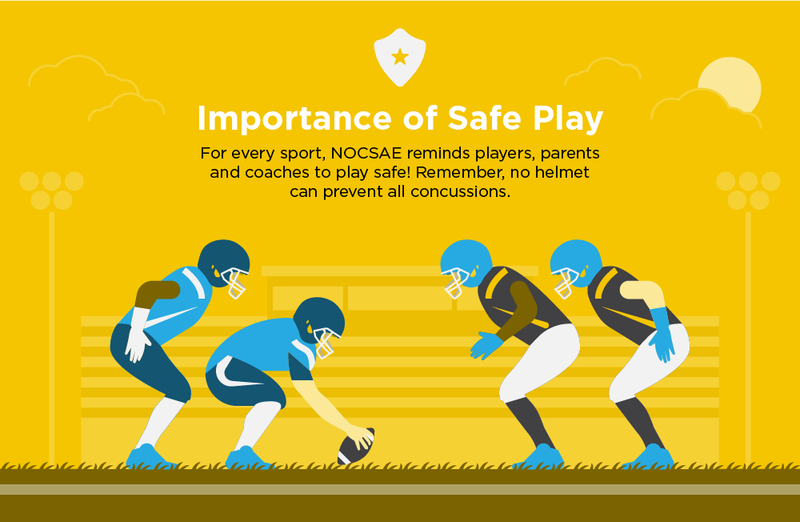 NOCSAE cautions coaches, parents and athletes against relying on any individual data point, rating or measurement when making decisions about helmets. Doing so could lead to inaccurate conclusions or even a false sense of security that one helmet brand or model guarantees a measurably higher level of concussion protection than another for a particular athlete, and to ignore other more effective steps to reduce the risk of a concussion. Even though helmets have to meet demanding testing and performance standards, concussions will still occur in any helmet. More scientific data is necessary to learn how helmets can better protect athletes against concussions without increasing the risk for other injuries. Since 1995, NOCSAE has devoted more than $9.1 million toward concussion-specific research by the foremost experts in sports medicine and science to find the answer to that question. 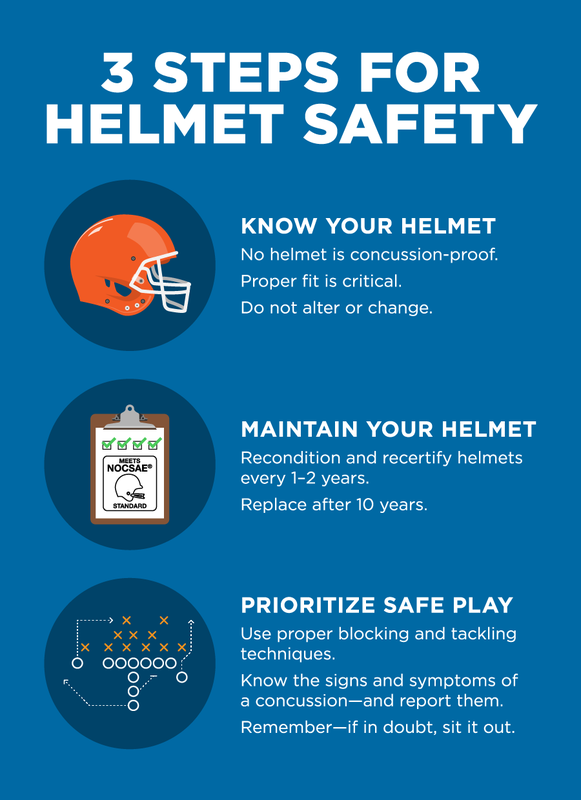 While football helmets play an incredibly important role in protecting athletes in the field of play, they are only part of the protection against concussion. Learning to avoid unnecessary head impacts and reducing the opportunity for head impacts through proper practice structure, tackling techniques and field awareness will provide the most direct and effective protection against concussions. In addition, players must accept the responsibility to report concussion symptoms; give honest responses to coaches, training staff, parents and others when asked about concussion symptoms; and when a concussion is diagnosed, strictly follow medically supervised return-to-play programs.